Searching the antique shop’s crowded shelves like a detective, I spotted an interesting wicker basket. Heaped with linens. Digging down, I pulled out a stack of vintage quilt squares, held together with a safety pin. The pile consisted of already pieced blocks in antique white, contrasted with fabric in a faded red and gray pattern. All the blocks matched, except one. That square was similar – but the piecing deviated slightly from the rest. I wondered…could that be a Humility Block? The imperfect block left in an Amish quilt to show that only God is perfect? But wasn’t that a myth? The “imperfect” block looked most like the “Jacob’s Ladder” pattern to me. Though I liked the story of the Humility Block, research told me no quilter needed to leave an imperfection on purpose because no finished quilt was without mistakes. Besides, this quilt didn’t look at all Amish in design. The material was lightweight and limp, unlike any I’d seen on a quilt. More like an opaque voile curtain. It reminded me of a dad’s old pajamas worn way past their prime. Later I learned the squares were out of shirting fabric – fine cotton that’s often an 1800s reproduction. Most of the blocks matched & looked like this one. I swiped up those old squares with delight, handing over a fiver for the lot. At home, I laid them out. The pattern appeared to be a sort of Jacob’s Ladder. And the odd block out really looked the part, which was a mystery. Another thing puzzled me. Every piece of fabric was attached by hand sewing, stitches long enough to look utility-style. Perhaps they were basted, meant to be reinforced on a sewing machine. Or…maybe the squares were much older. The idea made me smile. I pictured a pioneer woman riding in her Conestoga wagon, wielding her needle with skill in spite of the rocky ride, readying a coverlet for completion once she arrived at her new home. There she could strengthen those seams with a little time on the treadle. Young, Kay, and Michael Crummett. Milk River Wagon Train: Fourth day ride; Memorial service for “Flash,” the horse . Malta Montana United States, 1979. Malta, Montana, September 2. Photograph. https://www.loc.gov/item/afc1981005_mc48/. Still, it was so fragile. Would it hold together if I left the squares in their original state? A half-hearted purist, I felt I couldn’t go over someone’s laborious work with a quick zip on my machine. Would that be right for the integrity of the blocks? For the hopes of the initial quilter and her quilt plan? Not sure what to do, I put them aside for a time. For a few years. Until I was invited on a special family trip to Alaska and needed a project for the long ride over the Alcan Highway. In a motor home. The (almost) Jacob’s Ladder quilt-top needed a lot of work. I had a lot of time on my hands. So the squares, my trusty thimble, extra needles, and a spool of new cotton thread came with me. A view of the hand-sewn interior of the finished quilt top. Plenty of strong, cotton thread. In my imagination, I was like the pioneer woman. In my modern covered wagon, bound for territories never before seen. Unlike the woman of my daydreams, rather than created out of necessity, my needlework only served to keep my hands busy across the miles. Between glances out the window at the scenery, I wondered about the original quilt maker, adding to her stitches where they had come away with my own, making the corners match as precisely as I could. Until the entire quilt-top was sturdy and sewn together. In a way, she rode with me on that long trip, rather like a companion in a quilting bee across time. I wonder if my unknown pioneer friend would have liked the final outcome of her work-in-progress? I sure liked thinking about her story. Adams, John Wolcott, Artist. Four Women Working on a Patchwork Quilt . , None. [Between 1900 and 1925] Photograph. https://www.loc.gov/item/2010714905/. One of my favorite sites in Redding, California sits on the corner of Shasta and Oregon Streets. A spacious, historic building that inhabits nearly a block. The Oregon Street Antique Mall. That store sends my antique-anticipating-heart racing when I step through the doorway. My last treasure hunt there, a lovely Roseville vase talked me into taking it home. Ridiculous, since none of my art pottery is even displayed now. They are all carefully packed in boxes. So what’s the obvious end for this piece of Apple Blossom patterned art-pottery? Easy answer. Still, I do enjoy it so much, decorating a small table, waiting for placement. A view of the Oregon Street Antique Mall. So much to tempt before one opens the door. The corner of Oregon & Shasta Streets. This is where the action is! The Antique Mall’s two floors hold diverse riches. But for me, the prime attraction is Kate Barker, the winsome owner. Her welcoming style is genuine and folks flock to her store’s events & because they are great fun. And, because she supports other businesses with a passion. Historic Downtown Redding and Kate Barker have a close relationship. Kate & Phil Barker. Photo UBP from Kate’s Facebook @Writer Kate Barker. A couple years back, the Oregon Street Antique Mall had been run by Kate & her husband, Phil Barker. But as they neared their 50th wedding anniversary celebration, Phil passed away. I watched Kate as she made the brave decision to continue running the Mall by herself. It was tough, of course. All the challenges that arose from operating a business were hers to resolve alone. Before, Phil had taken care of many hard things. Now Kate took it all on her shoulders, pressing on to a path she’d never wished to walk. But Kate wanted to make Phil proud. So she dug in, orchestrating new events to draw folks to Downtown Redding, learning to advertise on Instagram, and create memes for the Antique Mall’s Facebook page. As the one-year anniversary of Phil’s departure appeared on the calendar, I longed to do something to comfort Kate. Something special to mark the day. Since she had recently admired the antique, crazy quilt hearts crafted my friend Geo, I contacted her. Victorian Crazy Quilt heart cut from antique quilt & crafted by Georgina Diehl (Geo). Geo (Georgina Diehl) is a master at needlework and recycles antique crazy quilts by cutting up old quilt tops, forming small stuffed hearts or cats or Christmas stockings. The results are stunning and popular eBay items. 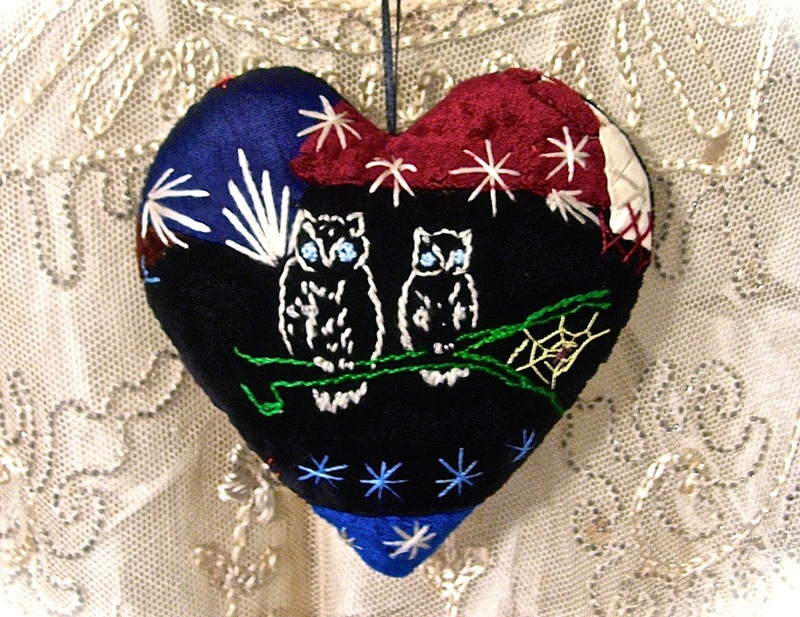 I knew I’d called on the right person when Geo, touched by Kate’s story, cut into a new, antique crazy quilt to make a small heart featuring a pair of embroidered owls. It was a sacrifice of sorts. Geo may have had other plans for those owls, but she generously offered them to make something exquisite for Kate. Geo’s creation backed with velvet from an antique opera cloak. And a special message for Kate. Backing the heart with a piece of velvet from an ancient opera cloak, Geo completed it quickly so I wouldn’t miss the looming deadline. The day I gave Kate the package, Geo had referenced her eBay dealer name – lavendergatherings – in the presentation, tying fragile lavender ribbon around the outside and attaching a lavender-filled sachet. Charmed, Kate turned it over in her hands, wondering aloud, “Whatever is IN there?” She opened it with ooos and ahhs. When she read the writing on the small paper heart attached to the back – “Forever Phil + Kate” – the tears came. Kate Barker and her owl heart. Because of Geo’s artistry and kindness, I was able to give Kate a unique gift to mark the day. The two owls – one larger, one daintier – represented the perfect pair, Phil & Kate. Love remembered and love remaining. Photo courtesy of Kate Barker. In Victorian times, when Geo’s crazy quilt top was first created, an owl symbolized wisdom, intelligence, protection, and vigilance. I realized these were all attributes and gifts I would wish for my friend Kate every day going forward. Only doubled. Recently, my friend and I spoke about an online article that claimed nobody wants your old, inherited stuff. Amen to that. My daughter’s home is lovely and filled with what she and her husband prefer. Okay, maybe a few cherished items from yesteryear, but not myriad collections. Nor are Donna’s children interested in her old bits and pieces. Only one granddaughter shares my friend’s passion. Without the passion part. Donna’s 1880s Wheatley Oil Lamp relocated to the fireplace mantel. This cool lamp has four sides, each painted with a different flower. It’s pretty special. And now, everyone can enjoy it. I’d come to see Donna’s newly acquired Wheatley Pottery oil lamp, but couldn’t get a good look because it sat on a shelf crammed with other antiques. Then I noticed her fireplace mantel seemed very crowded, as well. More Wheatley and other pottery, pictures of her children and grands in modern frames, and various treasured whatnots. Plus a plant or two. Why wasn’t the lovely oil lamp on the mantel with the other Wheatley cache? Boldly, I suggested some minor reshuffling. Indulging me, Donna played along. Soon, the pictures were on the shelf and the Wheatley was on the mantle. After a little creative reorganization, we had achieved something of a designer look. For ten feet or so. The redesigned mantel featuring: the Wheatley oil lamp, a small Wheatley Vase, a curved vase (also by Wheatley), a stoneware, Roseville fruit jar, one more Wheatley, & an American Belleek vase w/winter scene. The age of the pieces. colors, & primitive nature makes them go together. First, have a trusted “someone” take a look at your room with new eyes. As Donna said, “Things are just there and you don’t see them anymore.” When I noticed a less-than-lovely-basket filled with dried flowers, ready for retirement, Donna agreed. She freshened the display with different fronds in a favorite Roseville vase. Now she smiles every time she passes by that corner. A Roseville Bittersweet vase from Donna’s curio replaces an old basket. The foliage has been freshened & the arrangement shines atop this charming wicker table. Only surround yourself with items you actually like/love. One often displays an object out of respect for the former owner, but it gives no pleasure. It can go. Think “lots of white space.” As an author, I notice when big blocks of text make me want to close the page. If every space on every wall is covered, the eye has no place to rest. Look for things to delete from your décor. Lower pictures to eye level. We’ve all seen pictures floating near the ceiling. When asked why it hangs there, the answer is always, “There was a nail in that spot.” Go ahead & patch that old nail hole. Bring that picture down and it will become a member of a vignette family. Remember to group items in odd numbers: one or three or five, etc. My mother, an artist, taught me that principle long ago. It is more pleasing to the eye. Thinking odd numbers of items grouped together will help you choose only your favorites. The others? Bye, now. And of course, the old “less is more” adage. I believe in it, even if I don’t always adhere. It promotes white space and the choicest selections. Coming tomorrow – six more tips on how to recycle your unwanted collectibles…. During a recent trip to Washington, I enjoyed a lovely visit with my brother & sister-in-law (Mike & Pam) on Whidbey Island. And, as usual, acquired a few antiques. Among them, a lovely old pastoral painting in a wobbly, gilt frame. Something about the scene spoke to me & Pam encouraged me to buy it, saying she & Mike could make the frame fit. Once back at the house, Pam got busy, first removing the old frame – stamped with “Made in France” on the back. (Ooooo, France!) Mike took the frame apart in his man cave, then brought the pieces inside & laid them on the table. Pam lent supplies to work on the grimy-looking frame parts. With a turpentine-soaked toothbrush, I began a gentle scrub, trying not to dislodge any of the remaining gilt. Then, Pam handed me the painting to clean. Uh…how do I…? No idea. Google offered some choices. But which was best? If I used the wrong method, I might ruin my precious painting. Gulp. Maybe so, but ew. Not a fan. Use bread. Get a loaf of sourdough, break it apart & take some out of the middle. Rub gently against the painting…then brush it off. Really? On another site, the gal used the inside of a bagel. She seemed happy. Okay…no bread unless it’s a sandwich. Use a soft brush. I had a clean blush-brush so I tried that, going over the painting little by little, using circular motions. I was pleased with the affect. One could see the difference between the treated & non-treated areas. Soon, my bro & wife teamed up to trim the loose frame, Pam measuring & Mike using his table saw to trim a smidgen more. Once perfect, they glued & fit it into Mike’s homemade jig to “cure” overnight. The next day, painting & frame were reunited. Pam finished the project with new strap-hangers & wire. And voila! A mini-masterpiece…the result of a lot of loving care. Looks great on the wall. Thanks, you two! What a beautiful & generous gift. She looks great, even after 43 years! 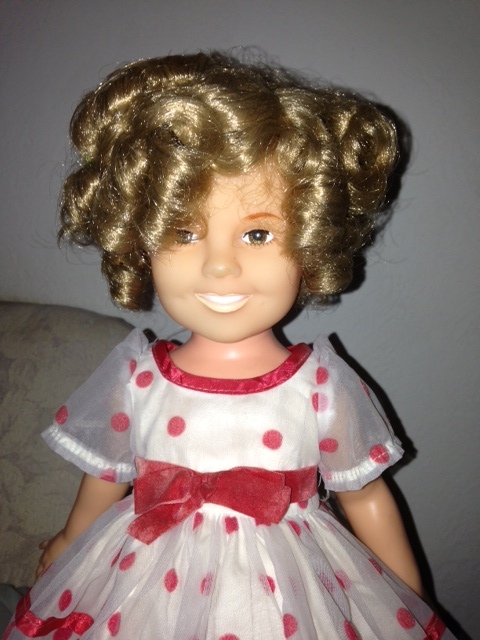 For many years, twenty-three to be exact, I stored my daughter’s classic Shirley Temple doll from 1972. Left behind when Heidi set out for college, I dutifully found a safe spot for Shirley to wait, gently pulling a clear plastic bag over her head. Couldn’t have those beautiful curls covered with dust! I’d check on Shirley once in a while. But she never ran away or got dirty. Good girl. A big Shirley Temple fan myself, I thought of the doll when I wrote my latest cozy mystery, A Stitch in Crime, placing her on a shelf in my fictional antique store. That dolly needed a little outing, for pity’s sake. Recently, Shirley was on my mind again. I invited my eight-year-old grandgem, Sidney, to watch a few YouTube clips of the curly-topped moppet singing & dancing. My girl was entranced. Soon my daughter stopped by & watched, too. I glanced at her & she looked at me, both of us emitting mutual “awws.” Amid the craziness of today’s world, I’d missed this sweet, sweet innocent darling from long ago, represented by those uplifting movies and that collectible doll. 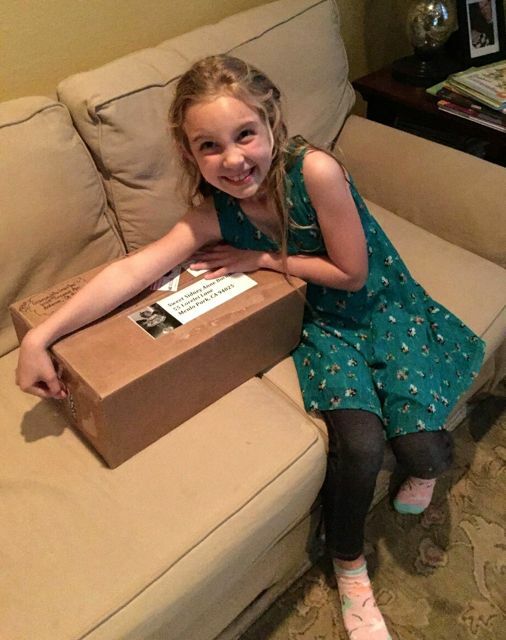 Sidney can’t wait to open her package. I did my best & my best was Wednesday. However, I decorated the mailing label with a pic of a Shirley doll & sent a video message from the very doll I’d just put in the box & mailed. Sidney emailed me back, thanking me for the video & saying she & her little brother were cracking up. Today, Sidney & Shirley were joyfully united. I hope she’ll treasure this new little friend. Maybe one day, she can pass it on to her own daughter. Meanwhile, I’m hunting for Shirley Temple DVDs to fill in the cultural blank. I think her heart will welcome knowing about a time when America’s Sweetheart enchanted all the country & uplifted us during a troubled time. 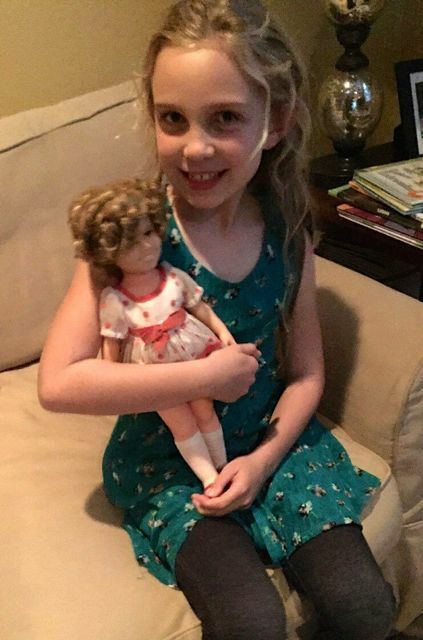 New mommy, Sidney Anne, with her own Shirley Temple doll. When friend, Angela McInnis (who crafted the quilt for my book cover), posted a pictorial record of her new Fiesta collection on Facebook, I rushed to check my own kitchen collectables, including vintage Fiesta, partying behind my cupboard doors. But my Fiesta is all from the 1930s & ‘40s & must be hand-washed. No microwave use. Yet, has a charm of its own. Unlike some of my collections acquired over many years, picking through antique stores, yard sales, & online, the Fiesta came to me in an unusual way. A friend of mine was getting rid of boxes of old things offloaded by someone. “Do what you want with these,” she’d been advised. Knowing I was a collector, she invited me over to check them out & help her decide what to toss & what to keep. Deep in the first box, I found treasure. And became over-the-moon-excited about some Vaseline glass pieces, hoping to absorb one or two into my small collection. I oo-ed & ah-ed so much, she decided to keep them all. Rats. But one box housed quite a lot of old Fiesta ware ready to use.The colors were mainly cobalt, yellow, light green, & ivory. Plus a couple broken bits, some chipped plates, & a cup with no handle. Of little interest to my friend, she offered the entire box to me for $75.00. Of course, I’d hoped for my favorite price. Free. But her price seemed fair. A few special pieces beckoned from the bottom. A carafe with its rare top & a mint, covered casserole. Later, shopping for missing pieces out in the antique world, I realized that three dinner plates alone might cost $75.00. 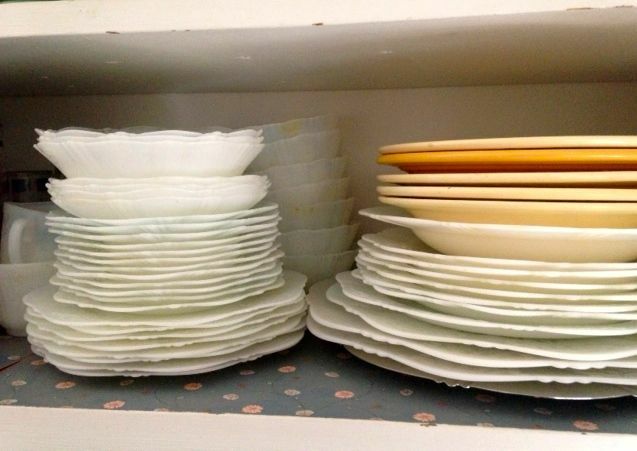 I had almost an entire set of dishes! American Sweetheart & Fiesta ware. Along with the Fiesta in my cupboard, reside my everyday dishes – a monax American Sweetheart set from the Depression era. They are lovely in form, opalescent, with a raised design decorating scalloped edges. Unlike the Fiesta, it took me ages to collect the American Sweetheart. 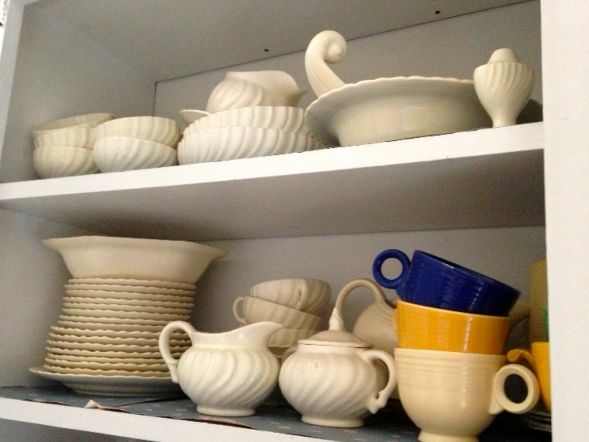 The top shelf is populated with early Franciscan ware (Gladding McBean) in a creamy, swirl pattern. A service for twelve, they have appeared in many Thanksgivings at my home, doing utilitarian duty in a most elegant way. I look into my cupboards & see great value there. Not how much they are worth. But the years of pleasure I’ve had, treasure hunting with like-minded dear ones. I see places I’ve been & conversations & laughter. 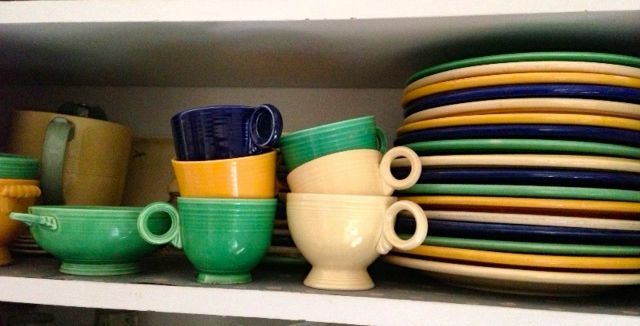 They are more than colorful dishes. They represent shared experiences. A very special lady once said to me, “Things do not satisfy. Only Jesus satisfies.” I so agree. These dishes are just things that will break & chip. They won’t last. But He knows what delights my collector heart. So I’ll enjoy them in the here & now, until the day when I’m walking on the streets of gold. When the due date was near, our Quills of Faith Writer’s Group gave a Tea-Party-Brunch-Baby-Shower (can you say that five times fast?) for our revered writing mentor, Cindy McCormick Coloma. 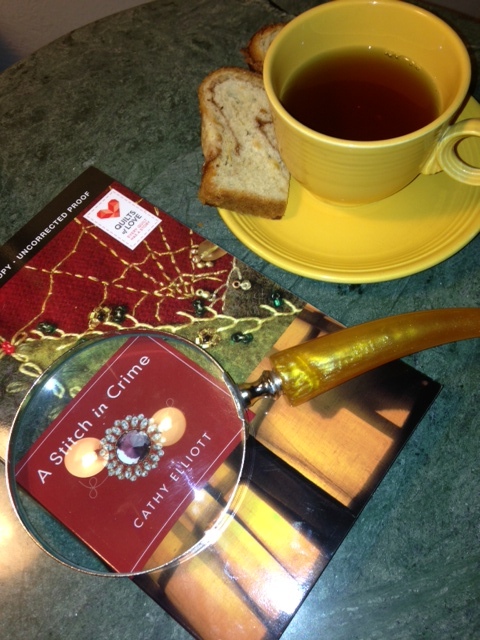 In lieu of games, we each brought our favorite teacup or mug to use and tell the story behind its specialness – in fifty words or less. A fitting and clever writer exercise we’d all enjoy. Owning a sizable collection of cups and saucers, I opened my curio cabinet to decide between various teacups. Which had the best story? What about that delicate cup of Grandma’s? Or the antique chintz charmer I bought in Alaska? I considered several, enjoying their cool smoothness in my hands, remembering how they came to be mine. Then I realized that many of my collections started because someone I knew collected it first. The teacup bought on an Alaska trip reminded me that my sister-in-law collected chintz long before me. In fact, I recalled once buying three pretty, patterned cups and saucers for her in an antique store in Woodland, California. The plan was to give my sis a set every Christmas for the next three years. Only, that’s not what happened. I gave her the first one as a gift, then accidentally displayed the others, adding to them on occasion, until it became a full-blown collection. A similar thing happened when I bought my niece a pink lustre plate for Christmas. Extremely attracted to this piece, I sensed the danger of another accidental collection about to materialize. And multiply. Since there were many months to go before the holiday, I wrapped that baby in a box and hid it in my gift cupboard. Or so I thought. Until I found three more pink lustre plates in an antique store in La Pine, Oregon. Those pesky plates persuaded me to take them home and soon showed themselves off on my wall, whining for a fourth plate. I dug it out of the gift cupboard and added it to the arrangement. Gorgeous. Great. Now, I collected pink lustre, too. And was in need of a gift for my niece. What did that say about me? Was anyone’s collection safe? Did I have to copy everybody’s coolest stuff? I hoped not. Perhaps there was another explanation. Maybe I just shouldn’t shop so early for Christmas.